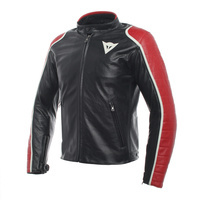 The Dainese Speciale leather jacket is another style in a large group of closeouts we acquired from Dainese. It offers special “retro” cafe styling in one color only, Black/Red. The Speciale comes with Dainese Pro-Armor in the shoulders and elbows and a compartment for a back pad which is optional. This jacket has styling queues you’d have found on bike jackets from the seventies and eighties such as the quilted red down the shoulders and arms and the special “DAINESE” lettering on the back. The lettering reminds me of the DeLorean logo from the early ‘80s ( the car in the Back to the Future movie), don’t you think? On the right sleeve, you’ll see a “Mr. Martini” patch. Nicola Martini is a custom bike builder in Italy (read about him here). The leather used in this jacket is a mid-weight leather that is plenty sturdy enough for motorcycle use. The finish is a bit different than some leather jackets. Its a “shiny” finish, but the surface of the leather is treated specially to give it a somewhat “crackled” look. Its hard to describe, but it gives the look of a very well cared for, but vintage jacket. It’s not so different from any other jacket that most people would notice, but some might think you really scored a find in a vintage bike apparel shop. Of course, any style riding would work with a classic cut of jacket like this, but I think this would go particularly well with any sort of cafe custom or retro styled bike (like what Mr. Martini builds). This jacket looks decades old but it has modern protection features that are very recent introductions by Dainese. The armor included for the shoulders and elbows is their new Pro-Armor type which is the honeycomb molded rubber you see from many premium brands. It is highly rated and is also soft and lighter than armor made of solid compounds. The back protector I’d recommend for this jacket is the Pro-Armor G back protector. Take the link below to order. It is a similar honeycomb design and will work great in a style like this. Dainese says: Speciale Leather Jacket is a full grain cowhide street jacket, dyed in a vat and subjected to a particular wax based finish for a distinguishing look. It brings together Italian flavor and the unmatched Dainese know-how in terms of style, fit and protection. The wax treatment contributes to the main characteristic of the jacket, the “pull up” effect, which makes each and every item of clothing unique and more precious as time goes by. The jacket features removable certified Dainese Pro-Armor protection on shoulders and elbows, and also has a back protector pouch.